Location: Grez-Neuville, in the Maine-et-Loire departement of France (Pays de la Loire Region). 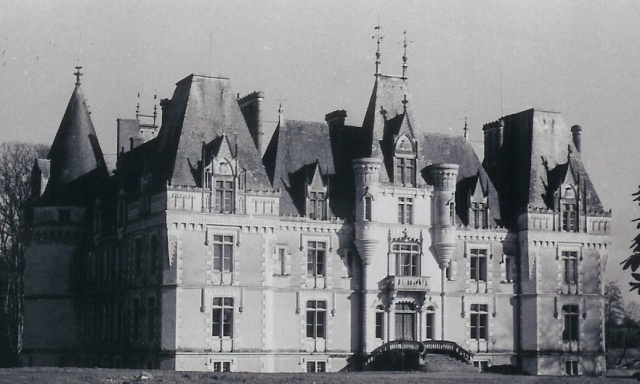 Notes: Château de la Beuvrière is a French castle of the nineteenth century located in the village of Grez-Neuville, in a place called the Beuvrière in Maine-et-Loire. The oldest documents mention in 1384 of Jean Valleaux, the oldest of the Lord attested Beuvrière. René Valleaux founded a chapel to 1500.Au nineteenth century it will be destroyed and replaced by the blessed in 1893. For four centuries it is the same family that lives Beuvrière, changing his name by alliances: On orvault, Hullin de la Selle, Terves. From 1765 until 1909, the castle is owned by the family of Terves. From 1827 the land of Beuvrière is démembrée1 and farms that depended since the sixteenth century as the Lower Beuvrière, Upper Beuvrière the Heel, the Vau, the Souchet, the Roberderie, Petit-Feudonnay are sold. The current farm area was built after 1861.